After joining your fellow travellers, you are free to enjoy the day as you please. Victoria Falls is well known for its wide variety of activities - including white water rafting, bungee jumping, sunset cruises and more. 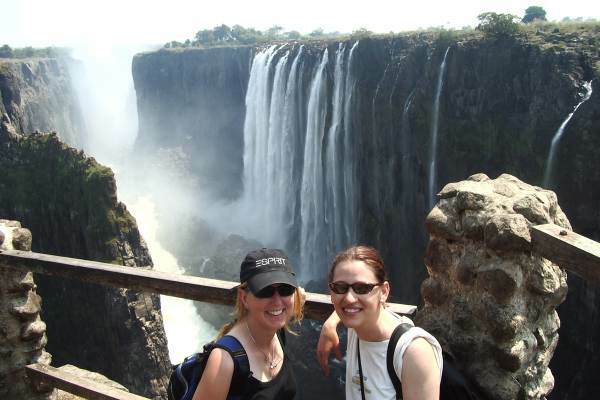 Victoria Falls is spectacular and a visit to the falls is included. Be prepared to get drenched from the spay. After breakfast we head for Botswana and the town of Kasane. 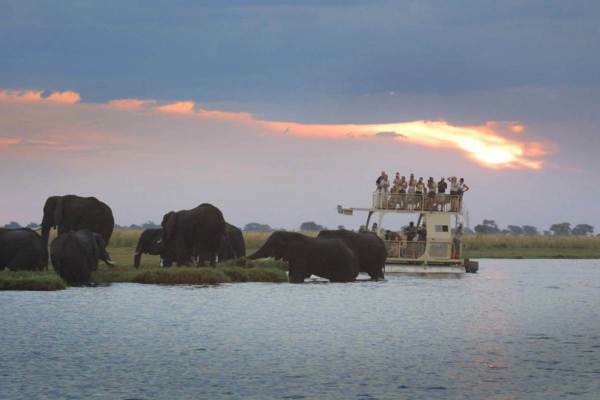 Chobe National Park is famous for its large herds of elephants and predators are common. We take a wildlife boat cruise down the Chobe River and can expect to see elephants, hippos and many other animals coming down to drink. Have your camera handy. The first night of our Okavango Delta adventure is spent in Maun - the gateway to the Delta. The Delta is one of Africa’s last true wilderness area and is home to many species of animals and birds. 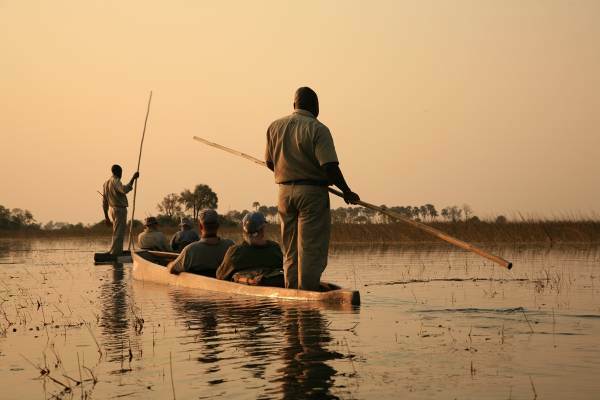 The Okavango is well documented for its winding waterways and abundance of wildlife. Our overnight excursion begins with a drive to meet or guides who will pole us through the delta on “makoros” (traditional canoes). Winding our way through the canals we reach our camp deep in the Okavango. The afternoon will be spent doing bush walks and and mokoro trails. The next morning we wind our way back to our vehicle and transfer to Maun, where you will be able to explore the town or even take in a scenic flight. A fairly long drive awaits us as we leave the delta and head towards South Africa. We spend the night at a popular campsite for those travelling across Botswana. Today we cross the border into South Africa and head towards the scenic Blyde River Canyon where we spend the night. The canyon is well known for its incredible views and we visit the famous “3 Rondavels” and God’s Window on the Drakensberg escarpment. There is a small entrance fees to access the view points, where you will also have an opportunity to buy some local crafts. Continuing our scenic drive along the Panorama Route, we head for our camp inside the Kruger Park. The Kruger is located in the “lowveld” which provides ideal conditions for wildlife to thrive. With a large concentration of animals, the Kruger is the ideal location for a safari. We set up camp inside the Kruger Park and embark on a night drive where we have an opportunity to encounter nocturnal animals. An early start to the day as we head in search of the many species of animals and birds found in the Kruger, including the Big 5. The day is spent viewing Africa’s famous wildlife and we will visit some of the popular water holes and other viewing spots. After a morning of exciting animal viewing we will stop at one of the rest camps in the Kruger. The afternoon is spent trying to to find any of the animal species that may have alluded us. At sunset we head back to camp for a well deserved rest. After breakfast we pack up and leave the Kruger for our final journey to Johannesburg where our adventure tour ends. Local Payment - USD 690 - This is part of your total tour cost and is paid on departure to your guide.